I feel that I have a healthy level of skepiticism when it comes to teas that make health claims, especially when it comes to teas that claim to help with detoxing, clearing out all the bad stuff. This is primarily because I work in healthcare and the body is pretty good at removing toxins all by itself and doesn’t need a tea in order to do that. 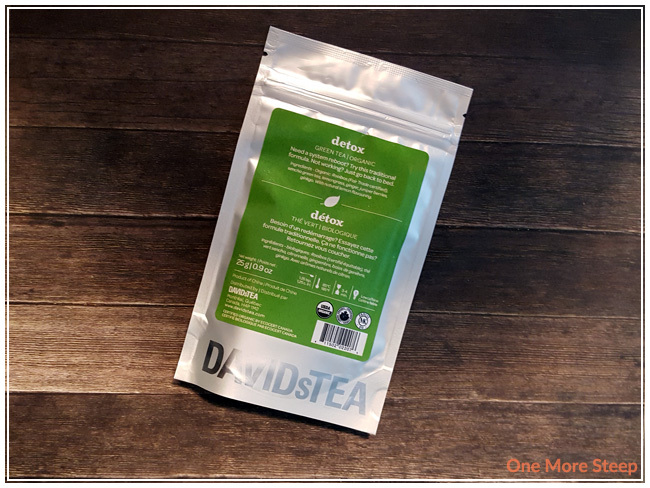 That said, I did give DavidsTea’s Detox a try because it is one of the fan favourites and I wanted to see if it is as good as people claim. 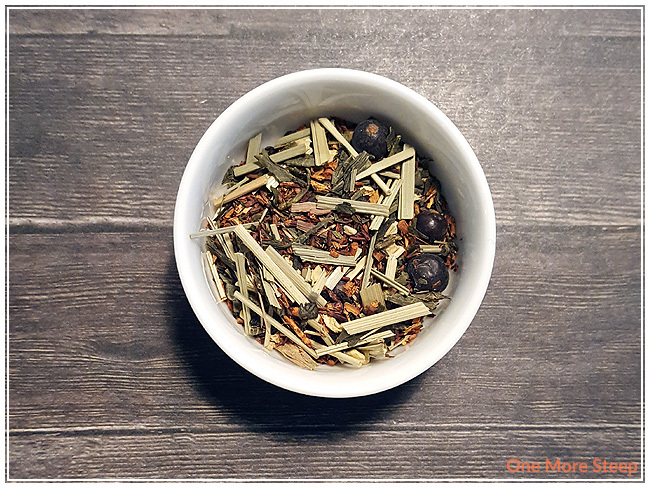 The ingredients in Detox are: rooibos, sencha green tea, lemon grass, ginger, juniper berries, ginkgo, and natural lemon flavouring. It has an incredibly strong ginger and lemon smell to the dry leaf, and I can make out most of the ingredients when looking through the dry leaf. As an aside, there can be interactions between ginkgo and/or ginger with certain medications. It is always a good idea to let your doctor and pharmacist know when you are consuming herbal supplements as they may be aware of interactions or things to look out for. DavidsTea recommends steeping Detox in 85°C (185°F) water for 3-4 minutes. I steeped for about 3 minutes. Detox steeps to a beautiful golden orange, and it smells quite strongly of ginger and lemon. 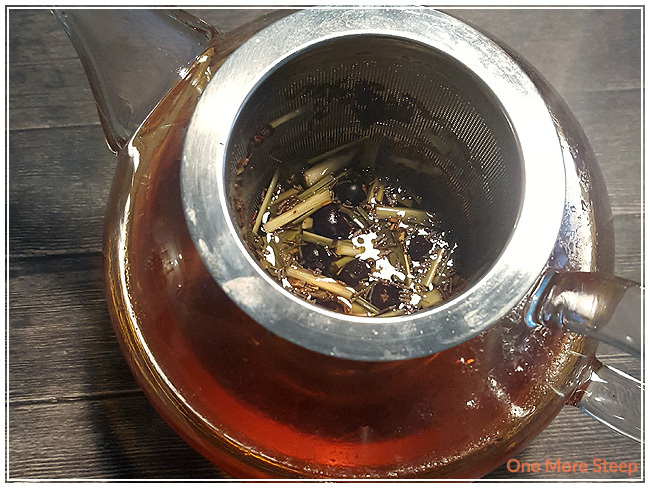 I find that the taste is also quite heavy on the ginger and lemon grass side, although I can’t really make out much of the green tea base or even rooibos. I’ve never had juniper berries so I’m not quite sure what those are supposed to taste like, but nevertheless I taste ginger and lemon grass. It reminds me a lot of when I was younger and if I was sick, my mom would make up a tea with some ginger, honey and lemons. This prompted me to add some honey to it, which actually helps the tea out a bit! The honey helps to make the lemon flavouring more pronounced and tones down the harshness of the ginger, which makes me feel a little it less like I should be bundled up in blankets on the couch. Detox does not resteep well, and I would say it is not a tea that’s meant for one more steep. The lemon grass, ginger, and lemon just falls very flat when I attempted to resteep it. It does not make for an enjoyable cup of tea. I thought that DavidsTea’s Detox was just okay. 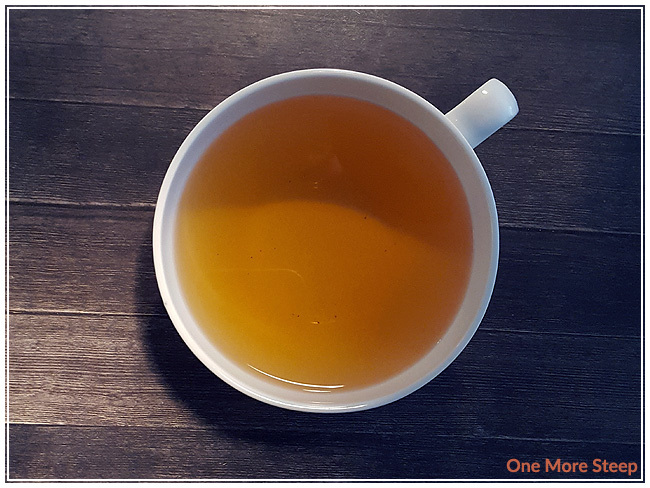 I think there’s some nice points to Detox – if I was feeling a bit under the weather, I may have a different opinion of this tea at that time (I will definitely make some again when I’m feeling sick and report back!). As someone who’s healthy and trying out Detox, it just reminds me of when I was sick in the past and brings back the feelings of not feeling great and having my mom take care of me. It’s not an everyday tea for me, that’s for sure, but I can appreciate how this tea would be good if I was sick. I would definitely recommend adding honey to it, I think it just adds a little something that the tea is missing otherwise.